I thought I would blog on this. 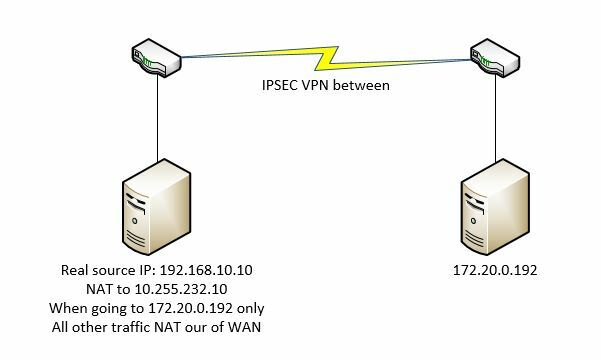 It could be useful for someone who might have an IOS router instead of an ASA and need to create a IPSEC Site-to-Site VPN to a remote peer, then NAT VPN traffic to a different address or subnet if needed, or the local subnets conflict with each other. That pretty much gets the VPN up and going. Now for the interesting part – we need to create a new ACL, match my private 192.168.10.10 address and the destination address of the remote server, then match that ACL in my Route-map. Great! So, we now have the route-map created.. so now what? We need to create a NAT statement that references my Route-Map. Then of course with any VPN we need to modify the “NO-NAT” ACL to include the traffic for both the 192.168.10.10, and the 10.255.232.10 to my remote destination. Now, if we try to access the remote side, does it work? Yes it does, but lets check to see if our nat is really working. It is! As you can see, 192.168.10.10 going to 172.20.0.192 is being natted into 10.255.232.10, but all other traffic gets natted out of the WAN interface. Bingo, everything works great. Lets make sure that we are getting hits on our Route-Map.